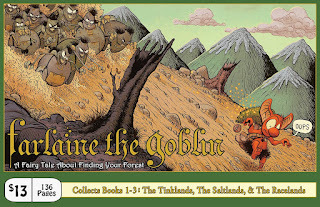 Farlaine the Goblin... Oh, what can I say about this wonderful graphic novel... It's delightful, it's funny, the artwork is great, the story is so creative and compelling! I just love Farlain the Goblin! He just warms my heart. And he's pretty adorable too. I want to step into the pages of this story and join along in the adventures... heck, I feel like I'm doing that already! The story is about a little tree Goblin named Farlaine (pronounced Far Lin... it rhymns with Goblin!) who is searching for his own forest. A place that he can call his own, that needs him and where he can live happily ever after. He has a magical "pet" tree named Ehrenwort that he looks after and who joins him in his search, and along the way he has unexpected and sometimes unwelcome adventures. 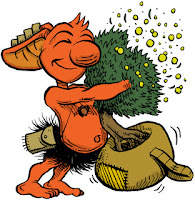 Oh and Farlaine is a Shaman, which means he has some special abilities, which come in handy, such as he can grow trees at a moments notice. I'm not sure, but he could get some help from Ehrenwort (aka Ehr). Along the way, Farlaine also meets some interesting characters (and I mean creatively imagined characters) and by the end of book 2, he has a buddy (a Tink) that joins him in his quest. Book 1 starts after Farlaine has already searched many years and a few hundred lands and only has 10 more lands left to find his perfect forest. And these "lands" are just wonderful! I don't want to ruin the story, so you'll have to read to find out about them! This trade paperback gathers the first three books in the 7 book series. This is kid friendly with no "serious" violence and no bad language. Adults will love it too! It is simply magical! The world created within the pages of this book is well thought out & developed, believable, fantastic and sprinkled with wonderful characters and concepts. This is a great story! If you like Bone, adventure stories, The Hobbit even, you should enjoy this! 5 stars from this girl! I'm thankful that my friend Joe put this in my hands to read, but I had to order one for myself because I wanted my own copy! *BTW, Besides loving the artwork, which is in black and white, I love the lettering, which looks more like it's been done by hand. America's First Daughter Release Week Blitz!